It is proven that school can have a negative impact on innovation. We want to fix that. 1. How much risk are a students willing to take and what is their perception of what will happen if they fail. NOTE: By risk we do not mean risky or dangerous behavior. 2. Does this data change by grade level, gender, age, location, socioeconomic factors, and other key metrics? 3. Is there a connection between the risk/failure data and students' engagement levels in science and engineering since both of those subject areas rely very heavily on the concept of trial and error. 4. Is there a connection between parents' level of risk/failure and students' level of risk/failure. Based on the data we collect we would then be able to determine if, how, and when a student's experience could be enhanced to help foster innovative and creative thinking during a child's learning process and, ideally, beyond and into the workplace. In summary, the premise we are trying to prove or disprove is outlined below. How innovative is your school or classroom? Using only two questions we can help answer that question. Our questions focus on two areas - Risk and Failure. Using our simple assessment tool, we can help you obtain a baseline as to how innovative your school or classroom is today and create and implement a plan to get you where you want to be. Contact us to learn more. Why focus on science and engineering? In 2012 Google conducted an internal study that explored what makes the perfect team. After poring through reams and reams of data, the results of their study could be summarized by one, yet extremely powerful phrase - Psychological Safety. Psychological safety is a shared belief that the team is safe for interpersonal risk taking. In psychologically safe teams, team members feel accepted and respected. (Edmondson, Amy, 1999, Administrative Science Quarterly) What Google found is exactly aligned with what The Innovation Company attempts to do when when working with groups to create a POP! Culture. A link to an article that provides an overview of Google's study can be found by clicking here. In addition, click here to watch a quick, two minute YouTube video that provides an executive summary of the findings. There is a psychological theory called Evaluation Apprehension developed by Nickolas Cottrell in 1972, that refers to the experience of being anxious about being negatively evaluated or not positively evaluated. If someone is operating from a place of apprehension - of being judged negatively, or, for example, being laughed at or ridiculed, how can schools and organization possibly expect people to come forward with innovative ideas? Therefore schools and organizations need to create environments that enable everyone to feel safe to share and express ideas and creative impulses. Evaluation Apprehension is grounded in scientific research and is proven to impact the environment in which people work, learn, or live. Finally, there is Social Learning Theory (SLT) that was developed by Stanford professor and researcher, Albert Bandura. In a 1961, Bandura conducted a study in which a child sat in a playroom with an adult who either a) played peacefully in the corner or who b) aggressively beat a five-foot inflatable clown doll named Bobo. The child then followed the experimenter to a second playroom where he or she was intentionally frustrated by not allowing him or her to play with certain toys. The child was then escorted to a third room and left to play alone for twenty minutes. Each child's behavior was carefully recorded in five-second intervals. Among the toys in this experimental room was a three-foot inflatable Bobo doll. Children who had been exposed to the nonaggressive situation generally played peacefully and were rarely aggressive toward the doll. However, those who had witnessed aggression often imitated that aggression. Like the adult models, boys and girls in the aggressive condition beat and yelled at Bobo. Compared to the children in the nonaggressive condition, these children also spent 50 percent less time sitting and playing quietly. As illustrated in the Bobo experiment, behavior may not be genetic, it may be learned. In addition, it is the environment that will play a critical role in influencing how students and employees will behave. Conceptualized as students’ energy and drive to engage, learn, work effectively, and achieve their potential at school, motivation and engagement play a large role in students’ interest and enjoyment of school (Martin, 2006). Understandably, both also play huge roles in academic achievement (Martin, 2001; Martin & Marsh, 2003). Consequently, those students who are motivated by and engaged in learning tend to perform considerably higher academically and are better behaved than unmotivated and un-engaged peers (Fredricks, Bulumenfeld, & Paris, 2004). Additional supporting evidence for the case for increasing employee engagement can be found here. The message is clear that engagement has a tremendous impact on a child's education and that school and society may actually be inhibiting a student's willingness to participate in his or her academic endeavors. This premise has been put forth most famously by Sir Ken Robinson in the most watched TED Talk of all time, "Do schools kill creativity?" Click here to watch an inspiring video from David Kelley of the firm IDEO that we feel gets to the exact point we are trying to make. It is about 10 minutes but please trust us, it is well worth your time. Why a focus on science and engineering? According to the Department of Education Only 16% of high school seniors are interested in pursuing STEM careers. However, the U.S. Bureau of Labor Statistics projects that, during the period 2010–2020, employment in S&E occupations will grow by 18.7%, compared to 14.3% for all occupations. Based the fact there appears to be a growing problem with the supply people interested in STEM careers and the demand for such people, there is a large push in America today for schools of all sorts - primary, secondary, trade, for profit bootcamps, etc. - to produce more scientists and engineers. But there is an essential missing piece - the environment or the culture of the school. Providing iPads, Chromebooks, or nifty gadgets does not create a culture nor do they guarantee innovative thinking. They are simply tools. While they may provide an initial burst of interest, It is the CULTURE that is they key to keeping students engaged over the long term. The lack of focus on the culture is a critical shortcoming to the promotion of STEM that needs to be addressed because science and engineering require exploration through trial and error, risk taking, problem solving, and creativity, all of which, without a safe environment, will succumb to the proven science behind Evaluation Apprehension, Risk Aversion, and Social Learning Theory that was described earlier. Here is an example. Let's assume a teacher asks a class to work in teams of six on an engineering problem. 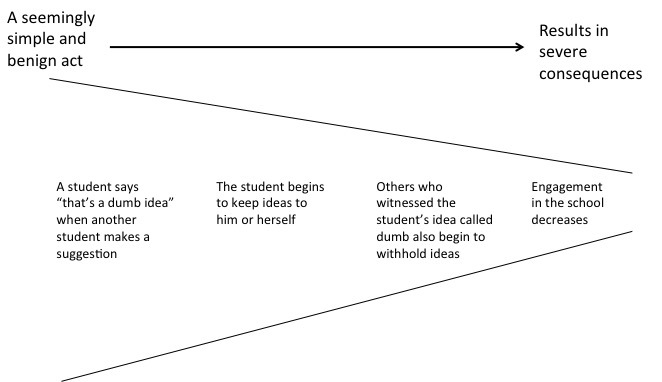 Imagine that one of the students on a team has an idea and proposes it to the group. Rather than being met with a positive response, the team reacts negatively and dismisses the idea as 'stupid' or as something 'that will never work.' Also on that team is a another student who watches this exchange and internally says to himself "I better keep my ideas to myself." Within seconds, engagement levels are decreasing. Later in the school year the student who had his idea rudely dismissed and the other who retreated from the group show a lack of interest in engineering. The school decides to increase funding and provide more technology and STEM teachers. However, those resources will have no impact since the environment does not enable everyone to share his or her ideas when trying to solve challenging problems. What do Cinderella, The Little Mermaid, Sleeping Beauty, and Snow White have in common besides being Disney movies? In each one the girl has to be rescued by the boy. This sends a serious message, and one that goes well beyond the movie theater and, in the classroom, can to lead to what is known as gender bias. Therefore, based on the topics we have discussed it can be difficult for any student to share ideas without being met with negativity or responses that stifle creativity; however, it can be especially problematic for girls. Earlier we discussed how children begin to be affected by concepts such as Evaluation Apprehension, Social Learning Theory, and Risk Aversion as they progress through school. With that in mind, we want to ask our questions throughout various grade levels to see if we can identify a tipping point of sorts when the tolerance for risk/failure hit what we will call "a point of no return." This may or may not be the case so hopefully our research will help us determine the ideal point for interventions and enhancements to school curriculum. Famous astronomer and scientist, Carl Sagan, once noted that, "“Every kid starts out as a natural-born scientist, and then we beat it out of them. A few trickle through the system with their wonder and enthusiasm for science intact." In addition, Gordon MacKenzie, in the book Orbiting the Giant Hairball: A Corporate Fool’s Guide to Surviving with Grace, talks about visiting elementary schools. “How many artists are there in the room? Would you please raise your hands? FIRST GRADE: En mass the children leapt from their seats, arms waving. Every child was an artist. SECOND GRADE: About half the kids raised their hands, shoulder high, no higher. The hands were still. THIRD GRADE: At best, 10 kids out of 30 would raise a hand, tentatively, self-consciously. By the time I reached SIXTH GRADE, no more than one or two kids raised their hands, and then ever so slightly, betraying a fear of being identified by the group as a ‘closet artist.’ The point is: Every school I visited was participating in the suppression of creative genius.” In other words, it appears the earlier we can get to kids and keep that 'first grade mindset' in place the better. We plan to work with elementary, middle/junior high, and high schools in our research. Our concern with picking one grade or one specific range of grades is that we could possibly miss an important data set. Are you an educator looking for ways to increase student engagement and create an innovative classroom or school? We have tools to measure and assess, apps to make things fun and engaging, and lessons to make things easy and simple. Contact us and let's start a conversation.